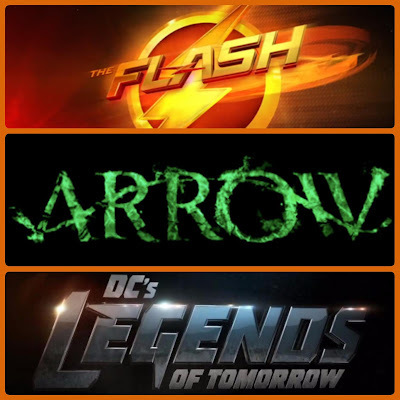 The week of February 22 is going to be a wonderful time for fans of DCTV as King Shark takes center stage on 'The Flash,' the first live-action appearance of Vixen (Megalyn Echikunwoke) on 'Arrow,' and a very different yet familiar Green Arrow (Stephen Amell) is seen when 'Legends of Tomorrow' lands in 2046 Star City. “ARROW’S” DIGGLE (DAVID RAMSEY) AND LILA (AUDREY MARIE ANDERSON) CROSS OVER TO “THE FLASH” TO TAKE ON KING SHARK – When King Shark escapes from an A.R.G.U.S. holding tank, Lila (guest star Audrey Marie Anderson) and Diggle (David Ramsey) travel to Central City to warn The Flash (Grant Gustin). King Shark shows up at the West house and attacks Joe (Jesse L. Martin), Iris (Candice Patton), Wally (Keiynan Lonsdale) and Barry. Hanelle Culpepper directed the episode written by Benjamin Raab & Deric A. Hughes (#215). Original airdate 2/23/16. VIXEN JOINS TEAM ARROW – Oliver (Stephen Amell) realizes he needs help battling Darhk (guest star Neal McDonough) so he calls in an old friend – Vixen (guest star Megalyn E.K.). Using her magical ability to summon animal powers, Vixen gets a lock on Darhk’s location and the team goes to war. Meanwhile, Thea (Willa Holland) has a heart-to-heart talk with Malcolm (John Barrowman). Gregory Smith directed the episode with story by Marc Guggenheim and teleplay by Keto Shimizu & Brian Ford Sullivan (#415). Original airdate 2/24/16. THE TEAM ENCOUNTERS A VERY DIFFERENT OLIVER QUEEN – When a malfunction sends the Waverider crashing into 2046 Star City, our heroes face a startling version of their own future where they never stop Savage (guest star Casper Crump) and never return home. The city is in ruins and overrun by criminals, which thrills Rory (Dominic Purcell). Sara (Caity Lotz) is despondent over the destruction of her home and stunned when she learns what happened to her old friend, Oliver Queen (guest star Stephen Amell). Steve Shill directed the episode written by Marc Guggenheim & Ray Utarnachitt (#106). Original airdate 2/25/16.